With the current state of the property market in Australia, a not-uncommon situation can arise where a residential property owner wants to demolish and subdivide the block containing the family home and build residential units. If you have the available land, this is a solid strategy. However, from a tax perspective it may bring unforeseen stress. And in some cases the ability to access the main residence exemption and even the CGT discount can be lost. A question that arises every now and then concerns the effects on the CGT main residence exemption where the owners decide to subdivide the land containing their principal place of residence, in some cases demolishing the existing home, and to build residential units. Demolish the main residence, subdivide the land, build two home units, sell one and live in the other. Subdivide the land, build a home unit on the newly created and previously vacant portion, then sell the unit (with the original residence staying intact). Subdivide the land and sell the non-main residence block (with original dwelling staying intact). Whether demolition of the original main residence would trigger a capital gain or loss (if any)? 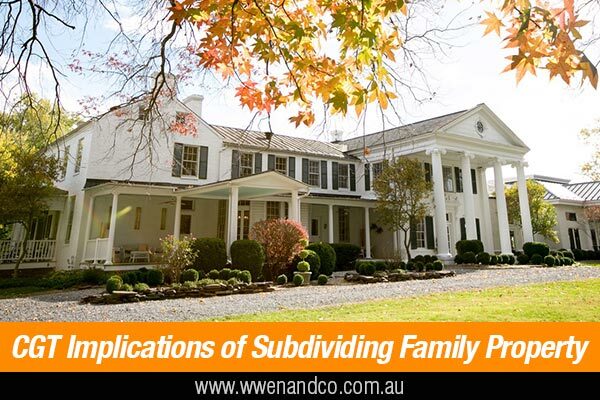 What are the CGT implications of subdividing the property? Is the sale of the home unit or vacant land a “mere realisation” or is there is a profit-making activity conducted? How would the original dwelling/unit, retained and lived in by the taxpayer, be treated for CGT purposes? Note that there may be some GST implications that are not dealt with in detail here. Suffice to say that any venture undertaken by homeowners in building units for the purposes of sale would, from the ATO’s viewpoint, most likely constitute an “enterprise” so you may need an ABN and registration for GST. Jim acquired a dwelling in May 2012 and lived there as his main residence. The land is less than two hectares. Due to the poor state of the home, it was demolished in June 2016. No consideration was received as a result of the demolition. The land was subdivided into two blocks and Jim then started to build a unit on each block.He continued to be the owner of both blocks. Upon completion in January 2017, Jim moved into one of the units as his main residence (as soon as practicable after completion). The unoccupied unit was sold in February 2017. Jim lived in rental accommodation from June 2016 until January 2017. The subdivision of land resulted in each new block registering a separate title. The subdivision itself has no CGT consequences, provided Jim continues to be the owner. However it did create two new separate CGT assets. A further consequence of subdividing the land into two blocks is that the cost base of the land is required to be apportioned to each new block in a “reasonable way” (such as using the land area or a market valuation). In disposing of the non-main residence unit, a question arises as to whether the building of the unit and its subsequent sale is a “mere realisation” or a profit derived from an isolated transaction. This is not always clear, and requires consideration of all the necessary factors. We can provide guidance if you are confused about your particular situation. Unlike the non-main residence unit, the main residence unit continues to qualify for the CGT main residence exemption. Note also that even though the original dwelling has been demolished, Jim can still extend the main residence exemption to the newly built unit provided that certain conditions are met. Specifically, he can choose to treat the vacant land as his “main residence” for a maximum period of four years from the time that he ceases to occupy the demolished dwelling until the replacement unit becomes his main residence (“the four year rule”). It is, therefore, possible for Jim to have an unbroken period of “occupancy” from the time that the demolished dwelling was acquired until such time that the replacement dwelling ceases to be his main residence. During this period, once a choice is made, Jim cannot treat any other dwelling as his main residence. Mary and John acquired a dwelling in April 1996, which was their main residence. The home had a swimming pool on land adjacent to the dwelling. Their adult children have left home and, requiring cash to fund their retirement, Mary and John have intentions of downsizing their living arrangements. In December 2016, they removed the swimming pool and subdivided the land into two blocks (retaining their existing home). They built a unit on the vacant block, which was completed in March 2017 and sold the unit in April 2017. As noted above, the subdivision of land does not trigger a CGT liability provided that Mary and John continue to be the beneficial owners of the subdivided blocks. The cost base of the property would need to be allocated to each block of land on a reasonable basis. As the unit built on the newly apportioned block was created with an obvious intention of making a profit, and as the owners have continued to use the original dwelling as their home, neither the CGT main residence exemption nor the CGT general discount applies. The fact that the unit was constructed on land that was originally subject to the main residence exemption (as part of the two hectare area upon which Mary and John’s residence was situated) provides no basis to argue that some part of the gain on disposal should be free of tax pursuant to that exemption. Unlike the non-main residence unit, the main residence continues to be subject to the CGT provisions, including the main residence exemption. The subdivision of the land has no effect in this regard, however the cost base of the block containing the original dwelling would be reduced following allocation of cost base between the two blocks. Bob acquired a dwelling in August 1996 for $400,000, which was his main residence. In September 2012, the property was subdivided into two blocks with one block containing the dwelling (front block) and the other block being vacant (rear block). Bob continued to be the owner of both blocks. The legal costs for the subdivision were $10,000. At the time of subdivision, Bob’s real estate agent advised that the value of front block and rear block be split 50/50. The rear block was sold in December 2014 for $400,000. Again, the mere subdivision does not trigger a CGT liability provided Bob continues to be the owner of both, and the new cost base of each will need to be apportioned on a reasonable basis. For its part, the ATO has indicated in various rulings that situations similar to Bob’s would not necessarily result in an “enterprise” for GST purposes. For income tax purposes, it follows that the ATO would likely consider that Bob has disposed of the land by way of “mere realisation” as opposed to realising a gain from a profit-making undertaking. Accordingly, the sale of the vacant block would be on capital account and the CGT general discount would be available if the asset is owned for at least 12 months. Therefore the net capital gain to Bob from the sale of the rear block is $97,500 (that is [$400,000 less $205,000] x 50% general discount). However, the net capital gain on the sale of the vacant land would not attract the operation of the main residence exemption. As a general rule, adjacent land would be subject to the exemption if it was primarily used for private and domestic purposes in association with the dwelling. However, the exemption only applies if the land and dwelling are sold together. As a result, the net capital gain of $97,500 would remain assessable to Bob.